You might remember our good friend Megna from Just the Tip’s NYE ’06 show at Stout, where he was smashing champagne flutes by the tray-full during the year-end countdown. 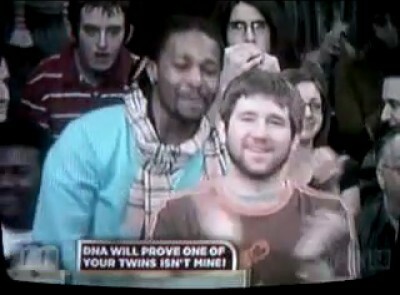 Well he’s back again, this time making an audience appearance on Maury (formerly The Maury Povich Show) in a segment titled DNA Will Prove One of Your Twins Isn’t Mine. You can see him right at the 8:22 mark throwing out his very best “Oh no he didn’t!”.